The concept of beauty lies on your feet! Ya! Your beauty would be more glorifying when you can make a beautiful toenail design. And now a days, it is very convenient to make your nail design and change the design every day. 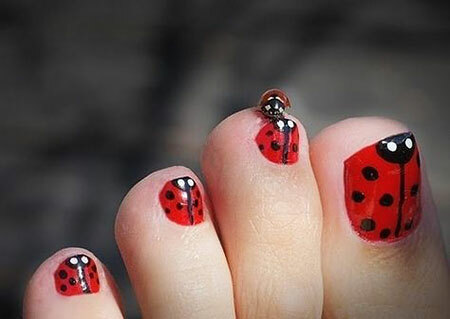 Apart from the nail paint, you can use different accessories for your toe design. The accessories can be rhinestone, glitter and so on. Additionally, you can mix different design and use in your different toenail. Here is some samples of the design that might catch your eye and heart. The navy blue with white end French tips is a beautiful one. Using stones on the thumbnail is the touch of elegance and has a royal flavor. This is the cute toe design. The thumbnail is painted with dark pink and stones while the other fingers have got light pink. The contrast of the same color makes the design most desirable. The art of the thumb and using no art on the other fingers has made the design more versatile and beautiful. The combination of turquoise and dark grey are mind-blowing.